It is a sign. A blessed sign. A sign from God. 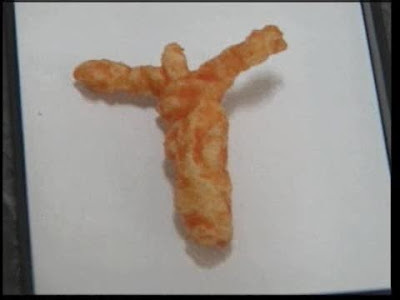 Here is a closeup of Cheesus. Behold it's the cheeses of Nazareth! Laughing too hard to speak. "I think the bottom line is the joy that it's bringing"
Holy crap! I've enjoyed a Cheetoh or two in my life, but I'd never say they brought be joy. If she had showed it to me I would have eaten it. And you would have lived forever. Too bad now. Meh. Who wants to live forever? Election season seems too long. Imagine an eternity of 'em! I just had a mystical experience. I split open a peanut and found Confucius! This could go on forever. Let's just cut to the chase here. "I just had a bowel movement and found [insert name here]". now everyone can play along.